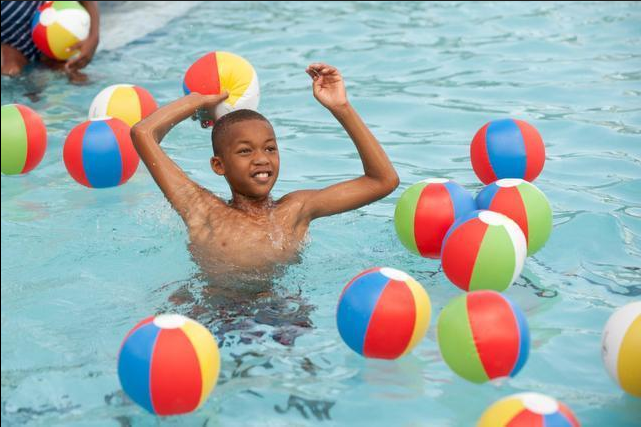 Jalen Brown, 8 enjoys the new pool at the Murray Park Aquatic Center in South Miami. More than 100 people turned out for the grand opening of the park. At least once a week for about five months, Jalen Brown and other children from South Miami boarded a bus and took the 15-minute drive to Ransom Everglades School in Coconut Grove for swimming lessons. Along the way the children, many of whom live in low-income housing, saw “mansions” they dreamed of living in and cars they hoped to afford one day. The bus ride bridged a gap from their small, historically black community in South Miami to the affluent private school where swimming is part of the routine and not a privilege. Click here to see more photos of the pool. Most of these children, as young as 5 and and some 10 and 11, never had a swim lesson before. Some had never been in a pool. Most didn’t know how to swim. "Kids who are living in public housing, growing up where finance is a real problem, single-mother households, opportunities for just having access to a pool are limited,” said Simon Codrington Jr. from the South Miami Community Advisory Committee and a longtime resident of the city. Codrington and a core group of South Miamians set out to change that decades ago by lobbying City Hall to build a public pool. Even with Florida having the highest drowning rate in the country —and the drowning rate is highest among black children — the fight for to build a community pool for the kids who need it most has been filled with years of empty promises and failure. But now, after four decades of protests and City Hall visits, the mission has finally paid off. This week, city leaders cut a ribbon on a $1.4 million pool, with three lap lanes, a gentle slope to enter and a splash pad area. When the pool opened Wednesday, the children immediately showed off the skills they learned at that bigger, fancier pool in the Grove. “This pool is great,” said Jalen, wearing a Marvel bathing suit and doing the backstroke. When Jalen began lessons in March he didn’t even like to put his head underwater. “I know how to swim now,” he said. The pool is at Murray Park, 5800 SW 66th St., in a city that’s 2 1/2 square miles between Coral Gables and Kendall straddling U.S. 1. The park is in the heart of a black community with many working families living in small homes and apartments. The roughly 10-block stretch was federally designated in the 1960s as a revitalization area, Price said. Next door to the pool is the Gibson Bethel Community Center, where many of the neighborhood’s children go during the summer and after school. For the kids of the area, this is the center of their lives. They walk there to play basketball or run around on the playground or attend events. Nearby is a free health clinic. The pediatrician in the clinic, Dr. Tina Scott, arranged a partnership between the city and the private school to address the lack of swimming skills she regularly saw in her patients. So every week, about 30 kids boarded a van, some of them wearing donated bathing suits and using bags and towels given to them. When they first started the lessons, some of children didn’t want to let go of the side of the pool or the teenagers who volunteered to teach them. Andy DeAngulo, the aquatics director and assistant athletics director at Ransom Everglades, said since the school’s new pool opened in January 2012, they have opened up to teach underprivileged children how to swim as part of the REACH (Ransom Everglades Athletes Can Help) Program. At the Ransom pool, they they had opportunities they didn’t have back home. At an April lesson, Jalen used a kick board to get to his swim teacher and then used free time to chase his friend around. They groaned when it was time to leave and board the van back to the community center. Back in the 1970s, Leroy "Spike" Gibson, South Miami's first black commissioner, proposed a community pool after a spate of drownings in area canals. Codrington, who has also been a part of the community effort, said the water is a big threat to the community’s younger generations. Without a public pool to practice in, the canals that run through the city can end up being a danger for those who never learned basic swimming skills. Before the pool finally opened on Wednesday, the closest county pool was three miles away. That’s far, especially on public transportation. Enterprising kids, eager for a closer dip, woulds sneak into private backyard pools on the other side of town. "A single mother who relies on public transportation to get around, 9 times out of 10, she's not making a lot of trips," Codrington said. Besides a close and accessible pool, the kids also didn’t have access to swimming lessons. Julie Gilchrist, a medical epidemiologist at the Centers for Disease Control and Prevention, said there are “populations of people who lack basic swim skills." Gilchrist has spent much of her career researching drownings. Overall, she says, black children drown at a much higher rate than other kids. "In swimming pools ... presumably, you know where the bottom is, you know where the sides are," she said. "And so one would think that with basic swim skills it should be difficult for an older child or teen to drown in a swimming pool. And yet that's what we were seeing among African Americans." Swimming pool drowning rates among school-aged black children are more than five times higher than they are among white kids the same age. Even with those facts, it wasn’t easy to build a pool in South Miami. The community was divided. Williams says he and many other South Miami natives held on to the hope that one day the promises would be fulfilled. “This is something we have waited so long for,” said Williams, who was among the first group to leap into the pool and swim. When Williams was 14, his best friend Stacey Harrington, who was 12, drowned in a South Miami canal. He said if there was a pool then, things may have been different. “Now the kids in this neighborhood will have a safe place to swim,” he said. Over the years, the residents fought hard, holding protests and keeping the heat on City Hall. At least two times elected city leaders gave their support. But delays and financial concerns hampered the efforts and thousands of dollars went down the drain. “I can tell by the agenda items they are going to be in trouble come budget time,” she said. But she was outvoted by her commission colleagues. In February 2013, Miami-Dade County agreed to extend a grant after South Miami’s mayor and city manager approached Miami-Dade Mayor Carlos Gimenez. In April 2013, the city hired a company to start building the pool. Ground was broken in November 2013. The new pool won’t be opened all the time. A budget squeeze means it will close mid-September and reopen again next summer. But for now, it’s all going swimmingly. Cornelyus was one of about 30 children to take lessons at Ransom Everglades in preparation for the opening. His mother, Tantanisha White, stood at the edge of the pool and couldn’t get over how her son was swimming with no fear. After more than four decades, the City of South Miami now has its own public pool. A long-time resident named Simon Codrington Jr. had been trying to get a pool built in his city since the 1970s. Now, after several emotional speeches about the challenges of getting the pool built and the drownings that occurred in the interim, community members in South Miami quickly made themselves comfortable in the water. Florida has the highest rate of drowning in the country and for those younger than 4, water is the No. 1 killer aside from birth defects. But the danger is not spread equally among all children. Overall, black kids drown at a much higher rate than other children. But among the youngest group of kids — younger than school age — whites and Hispanics fare worse. It’s around the 4 or 5 years old when those tides turn and black kids drown at about three times the rate of other children. A few kids in South Miami, a city with no public pool, are getting the opportunity to take free swim lessons at Ransom Everglades School in Coconut Grove. Tina Scott, a pediatrician in South Miami, arranged the partnership between the city and private school to address the lack of swimming skills she regularly saw in her patients. “One of the things that I do when I see patients is to ask about water: Do you live near water? Do you have a pool in your backyard? A canal? To make sure that the kids actually know how to swim,” she says. Learning to swim isn’t always fun. It requires antagonizing months of adults throwing you in the water without floaties, expecting you to flap your way to the other side of the pool. But learning how to swim is a lot more fun if Miami Heat player James Jones is in the pool too. James Jones, along with team TV host Jason Jackson, took a dip with kids at Overtown’s Gibson Park Pool last week and discussed the importance of pool safety, all part of the Heat’s Learn To Swim campaign, now in its 12th year.